When it comes to fertility, pregnancy and women’s health, there’s a big gap in the information pipeline and many women struggle to find alternative ways to get pregnant in a healthy way. Women’s health-related issues have been somehow vastly overlooked in many areas, and dealing with the problems that can surround fertility and pregnancy can be overwhelming. There are an estimated 135 million births worldwide each year, and about 1/3 of those are not live births, so you can see the importance of maintaining your health before you become pregnant or are thinking of becoming pregnant. Information can be valuable, but sorting through it takes time. Even your doctor may not be aware of much of the helpful information available. If you’re trying to conceive, keeping an ovulation calendar can be helpful, but there’s a lot more to “getting pregnant” than knowing when the time is right. The reproductive system is complex and preconception care is as important as pregnancy and postpartum health. All three play a major role in the healthiness of your baby. The fact is that many pregnancies are unplanned, so making good choices and knowing your options ahead of time can protect you against infections, injury and deficiencies. It can also boost your health so your pregnancy will be easier. That means you need to be living well and healthy before you find out you’re pregnant. You also need to know about the changes that will take place once you do become pregnant. When that miracle happens, each stage of pregnancy will have different concerns. Obviously your body will change drastically, but the changes that are going on inside you can be fantastic and perhaps a little scary. 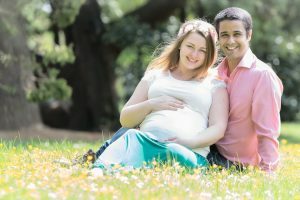 After one whole month, your new baby will be no bigger than a grain of rice, but the following 8 months will go by quickly as you prepare for childbirth classes, buying essentials and thinking about how you’ll handle it all. If you’re considering an alternative type of delivery, you may be looking into water birth, Cesarean birth, inducing labor, or using a midwife to help you give birth in your home. Whatever stage of pregnancy, pre-pregnancy or post pregnancy you’re in, the Ovulation Guide is here to help you wade through all the information out there. We’ve sorted through exercises, traditional and alternative lifestyle methods, supplement information, pre- and post-partum methods to make your life easier, enriching foods, and things in general to make you more comfortable. And we’ve sorted it out so you can understand it. You save time and learn more. We give you the big picture and break it down into manageable segments so you can choose which options are right for you. You’ll find everything you need from nutritional facts to miscarriage recovery. Learn about the early signs of pregnancy, signs of ovulation, staying fit during pregnancy without causing undue stress, depression and pain management, even chiropractic care. So don’t leave getting pregnant to chance! Learn all you can so you can conceive the right way and take your healthy baby to term!